Saskatchewan is the place to come for tranquillity, relaxation and a slower pace of life, all set against a gentle, uncrowded terrain. You can explore its southern grasslands or the forested hills, rivers and lakes of the north without fear of fighting crowds and traffic. It’s a place for simple pursuits of walking and horseback-riding, world-class freshwater fishing and wildlife-watching. For a spot of culture and shopping, there are a handful of pleasant towns, including the province’s capital, Regina. The best places to stay in Saskatchewan allow you to soak up the province’s gentle and life-affirming pace of life. For true wildness, the Grasslands National Park, near Val Marie, offers rippling grasslands, treeless hills, herds of bison and a wild beauty. For more variety with your wildness, Cypress Hills Interprovincial Park, in southern Saskatchewan, offers open prairies and forested hills dotted with lakes plus the chance to spot elk, deer and moose as well as a variety of birdlife. If you want a choice of outdoor activities, Prince Albert National Park offers canoeing, hiking and swimming amongst its empty stretches of forests and lakes. Try the 20-kilometre trek to Grey Owl’s Cabin, and then recover with an afternoon lazing on one of its lakeside beaches. Keen fisher folk will like Lac La Ronge Provincial Park in the north of Saskatchewan, dominated by the vast. Island-dotted Lac La Ronge. Altogether the park has over 100 lakes as well as hikes amongst its pine forests. When you’ve had your fill of wild country, Regina has a clutch of museums including the Royal Saskatchewan Museum (natural history and culture), Saskatchewan Science Centre (over 180 hands-on exhibits, observatory and IMAX theatre) and Sports Hall of Fame as well as grand Beaux-Arts legislature buildings. All are found in Wascana Centre, a vast leafy park with a stunning lake, walking trails, a bird sanctuary and home to mink, hare, beavers and the odd moose. The other town worth visiting is Saskatoon, home to the flagship branch of Saskatchewan’s Western Development Museum - a faithful re-creation of Saskatoon around 1910. Here you can wander along Canada's longest indoor street, popping into assorted buildings, including a pharmacist, the town jail and a dentist’s surgery. Elsewhere, trains, tractors and sleighs buzz around the streets. But wildlife and nature is never far away in Saskatchewan, even in Saskatoon. The South Saskatchewan River winds its way through the town, part enclosed in the Meewasin Valley nature reserve, where the 60-kilometre Meewasin Trail weaves through forests and along the riverbank. The best places to stay in Saskatchewan allow you to enjoy the best of its wildernesses and gentle city life. 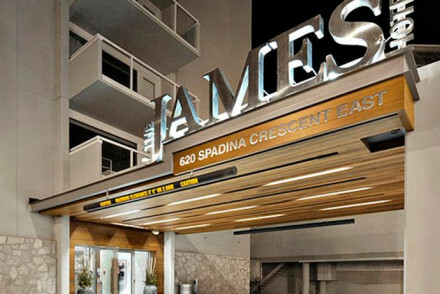 The James Hotel in downtown Saskatoon offers sleek contemporary interiors with hardwood floors and neutral colours. Luxurious suites boast balconies with wonderful city views, and the lobby bar is a buzzing spot for pre or post dinner drinks and cocktails. Nothing here that fits the bill? Browse our list of the best places to stay in Saskatchewan or contact a friendly guru for some advice. A contemporary downtown hotel on the banks of the South Saskatchewan River. Hardwood floors and clean crisp lines give the palatial suites a sophisticated chic feel. Classic cocktails and vintage wines are available in the trendy Lobby Bar. A grown up hideaway in the city centre! Great walks - Saskatoon Forestry Farm Park and Zoo a National Historic site features intimate garden and historic buildings. Sights nearby - Mendel Art Gallery is under two km away.